An Ohio father and grandfather who is in desperate need of a new kidney was surprised with the news that his neighbor and longtime family friend will give him her kidney on "Good Morning America" today. 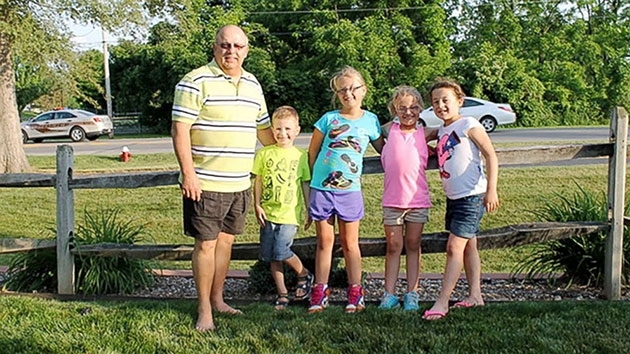 (SYLVANIA, Ohio) — An Ohio father and grandfather who is in desperate need of a new kidney was surprised with the news that his neighbor and longtime family friend will give him her kidney on “Good Morning America” today. Nancy Seigneur, 52, surprised Dave Courtney, 63, her decades-long neighbor in Sylvania, Ohio, with the news that she is a perfect match and will donate her kidney to him. “I’m speechless,” said Courtney, who has been living with a serious kidney disease since 1990. In April of this year, Courtney’s kidney condition worsened and his doctors forced him to go on dialysis. “Dave and Chris, they’re very private about it,” Seigneur said of Courtney and his wife, Christine, adding that her family and theirs “instantly became friends” when they moved into the neighborhood. Dave Courtney was put on a transplant waiting list three years ago, but so far has had no calls. “He’s definitely worried, and I think you know the uncertainty of not knowing, ‘Am I going to get a kidney? '” Christine Courtney said. Seven days a week he is on the dialysis machine, as well as all night while he sleeps. Dave Courtney said the love of his grandchildren helps him to stay strong. “I’m very positive in my belief that there’ll be a positive outcome of this,” he added. A few weeks ago, Nancy Seigneur tested to see if she and her neighbor and friend would be a positive match so she could donate her kidney. “I am the donor for Dave and I am so excited for him to find out, and for this to happen and for him to have a great life,” Nancy Seigneur said prior to the surprise. For more information about kidney donation or transplantation for a loved one, visit the Alliance for Paired Kidney Donation, the organization that connected “GMA” to Seigneur and Courtney’s story.